What is the difference between an over achiever and a super achiever? 1. Plan for tomorrow today! Take 10 minutes at the end of the day to make a priorities list. 2. Establish the top 3 goals that need to be accomplished. 3. 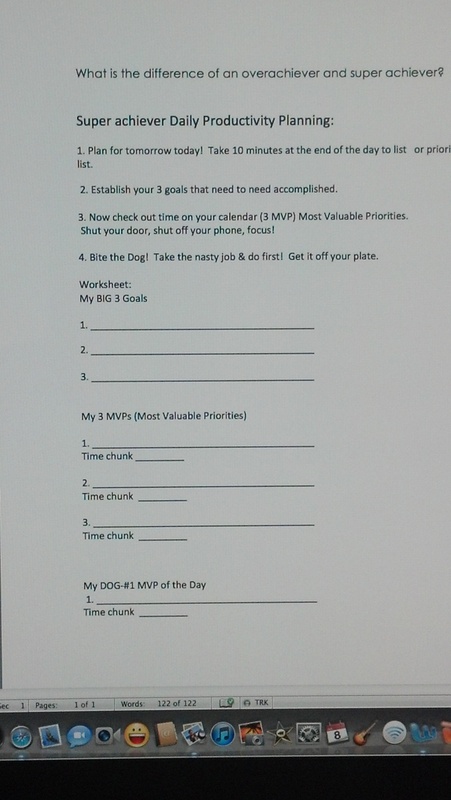 Now check out time on your calendar (3 MVP) Most Valuable Priorities. Shut your door, shut off your phone, focus! 4. Bite the Dog! Take the nasty job & do first! Get it off your plate. More about managing your people and business! Just because I don’t go to church! One life – Only so many breaths. I've decided to pursue my passion in jewellery designs since I love femininity and all things beautiful and sparkly, well almost all. I'm a proud mother to two gorgeous and amazing girls. I recently left the corporate world, went through a tragic loss and relationship breakdown yet I'm here alive and still very much wanting to pursue my dreams and maintain a state of happiness. This site opens up a new world for me to share and if I'm really privileged connect with with others.